You only have so much space in your fridge and freezer. And if you don't have the luxury of a second fridge or freezer (most of us do not), the existing space you do have is at a premium. Take a few of these quick tips to revamp and reprioritize your fridge and freezer storage systems to make meal prep, snack time and dessert making easier than ever before. 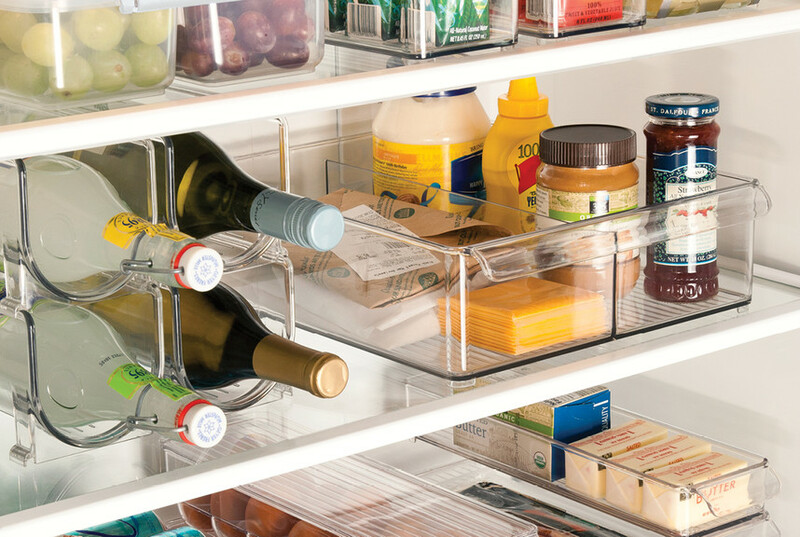 Take advantage of the adjustable shelves and drawers in your fridge and freezer. Not all fridges are created equal, but most do allow you to reconfigure the interior to help suit your needs. Since you most likely purchase quite a few of the same items each week, taking time to set your shelves and drawers accordingly will save you time otherwise spent trying to make everything fit. 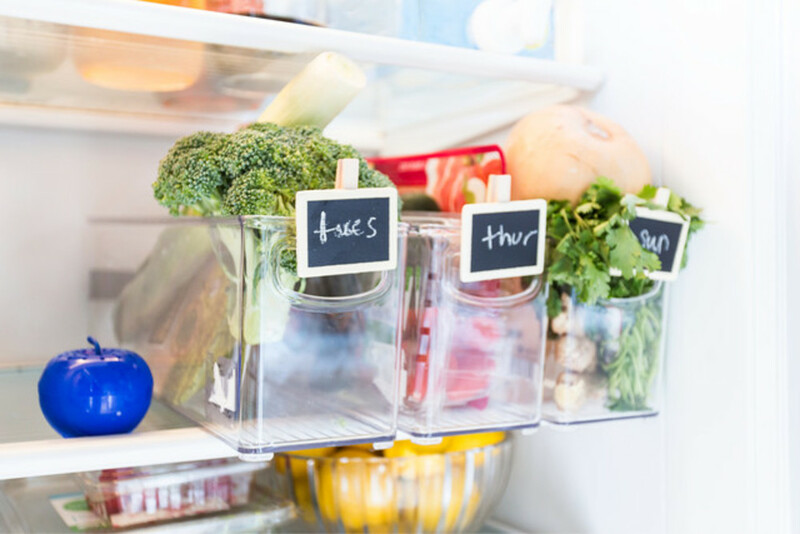 You can even get a bit more creative with your fridge organization by using our Linus Deep Drawer Binz and Chalkboard Label Clips and designating specific bins for specific days. Part of keeping an organized fridge is also keeping your fruits and greens at their freshest. Our BluApple Produce Fresh Guard and OXO greensaver Produce Keepers are fresh produce savers that maximize every bit of storage in your fridge. BluApple Produce Fresh Guard absorbs ethylene gas to slow premature ripening of fruits and vegetables and our clever greensaver Produce Keepers by OXO will help you waste less and save more. It works three ways to keep produce from spoiling. First, the all-natural, non-toxic activated carbon filters trap and absorb ethylene gas, slowing down spoilage. Inside, an elevated removable basket promotes proper airflow and helps prevent moisture buildup. And finally, the vent on the top helps maintain optimum humidity levels. Part storage part produce-saver all in one place. Keep the most often used items in the front of your fridge for easy access the whole family will appreciate. You may also find that ready-made snacks are helpful to curb your cravings — fresh fruit or veggies that are pre-washed and ready to eat will suddenly seem more enticing when they are clear, front and center. Everybody has that one narrow, yet impossibly deep shelf that never seems to be quite the right size to store anything at all. Use that awkward space to the best of its abilities by storing your leftovers there. Store them in containers that stack and are similar in shape, and will maximize the deep, narrow space. And don't forget to label your items before storing them. They'll be easy to identify and grab the next time you're in a hurry. Organize items within your fridge and freezer by size. Doing so creates a function and assignment for each shelf and makes it much easier to locate your small, hard to see items. Store items in jars or bottles in the refrigerator door and bagged items in the freezer door - making every inch of space work for you. Most fridges have tons of open, vertical space. To help you utilize every inch of that open space, look for bins, containers and organizers that are modular and stackable by design. 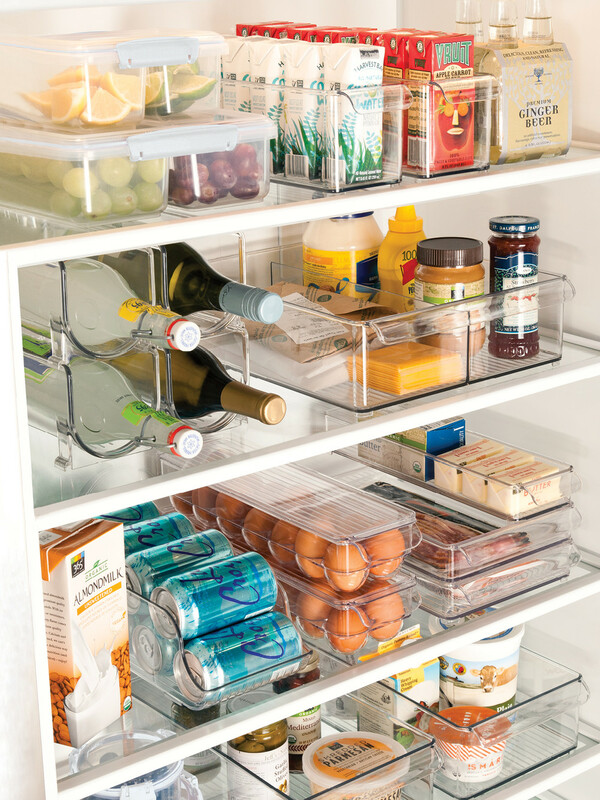 For example, clear, stackable fridge bins allow you to maximize the space within your shelves and make it easy identify what you need without pulling everything out. For more specific items like eggs or cans, think about using specialty solutions like egg holders that allow you to store more than a dozen, or a small-footprint soda dispenser with a lid so you can stack other items on top of it. We hope a few of these tips have helped spark some ideas for your big fridge and freezer organization. Let us know your own tips and tricks for keeping that space organized, below!